In the westernmost part of the Gulf of La Spezia is located the beautiful village of Portovenere. It takes its name from a temple erected in honor of Venus Ericina, in Roman times, built on the current promontory of St. Peter. The Cinque Terre are a kingdom of nature and wild scents maintained as in the past. Riomaggiore, Corniglia, Manarola, Vernazza, Monterosso are the five villages that make up Cinque Terre, suspended between sea and land. 15 km from the railway station of La Spezia and the Cinque Terre. A nearby walking path takes to Vernazza in 3 hours. The hotel is located in the building where in 1212 the local authority had its siege. The tourist that spends his Holiday here can sense that magical athmosphere that seems staged in the past. The village has a medieval origin and it is the best place for trekking lovers as you can start your walking from the centre of the village and reach Vernazza in just about three hours. La Spezia, administrative centre, is at just 20 minutes by car, there you can visit museums, the historic centre and from there you can have a trip to the pearls of the bay such as Portovenere and Lerici. Within an hour by car you can reach Pisa, Parma or Genua and if you add 30 minutes to your journey you can reach Florence. The Hotel Paese Corvara has multilingual personnel that will welcome you to your booked room. All bedrooms have en-suite bathroom and free wi-fi connection. The hotel has also two independent flats at just 50 metres from the main building. The first flat is bigger and can lodge till 6 guests. It has a living room with a sofa bed and a tv, a fully equipe kitchen, two double bedrooms and a twin room, a bathroom with shower. Outside the house there is a small garden where you can relax and have dinner outside. You can reach the second flat through a a small ladder: this flat has a double bedroom with a nice terrace, a small dining area, a small bedroom with a single bed and a chest of drawers, bathroom with a bath tub and a shower. All guests can benefit of the restaurant and pizzeria which serve traditional regional dishes. 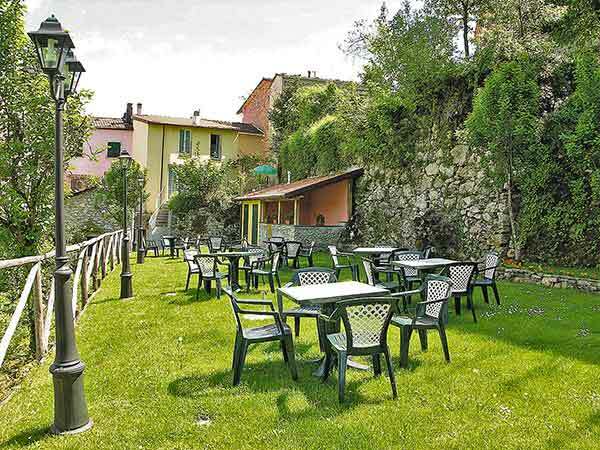 The pizzeria located in the back garden is set among the houses and has tables, chairs and sun beds to enjoy the garden and relax.